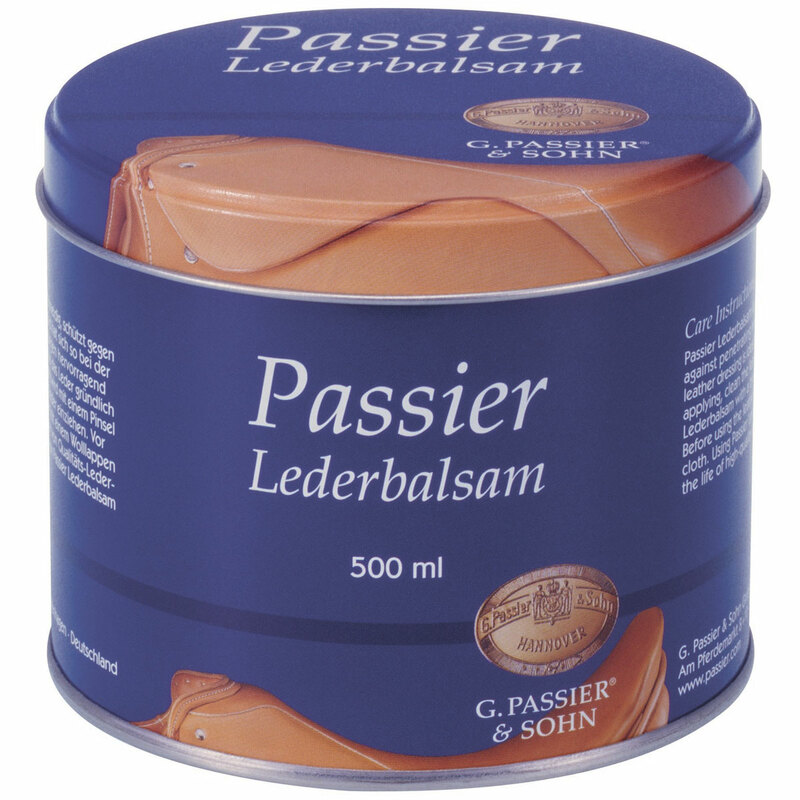 Passier Lederbalsam is a tried and tested leather conditioner that restores and preserves fine saddlery. Rich in nutrients without chemicals. "Lederbalsam" protects the leather against water and keeps it soft. Does not leave leather tacky or oily. Passier Lederbalsam is rated 4.9 out of 5 by 156. Rated 5 out of 5 by AMMANY from Never buying anything else again This is an incredible product. I recently used it to restore an older bridle and saddle. It is very easy to use and delivers a brilliant result. I will never buy anything other than this for my tack! Rated 5 out of 5 by JNST from Wonderful Stuff This balm conditions leather beautifully and leaves no sticky or dulling residue. It will be my go-to from now on. Rated 5 out of 5 by Valentine from Favorite Leather Conditioner I have used a number of leather conditioners over the years, but I keep coming back to this one after being dissatisfied with others. It has just the right amount of pliability so it spreads easily, but it isn't so goopy that it gets everywhere. This is the easiest leather conditioner I've used: after cleaning the tack with saddle soap and letting it dry, I apply some of this, let it soak in, and then buff it with an old tea towel. After buffing, I like to let my saddle sit for a few days and then buff it again, otherwise it is slightly tacky to the touch for the first couple rides; not to the point of annoyance or damaging to my full-seat breeches, but definitely noticeable. I use an old washcloth to apply this product to my saddle, boots, chaps, etc. (The washcloth will be useless for anything else after the first application, so it lives in my leather-care drawer.) A little goes a LONG way, so the tin will last a long time; I've had them last as long as 5 years, depending on how many saddles I cleaned and how often. I use saddle soap and this conditioner on my tack 3-6 times per year, and after each ride I wipe my tack down with a hand towel. My saddle sheds water if we get caught in the rain and wiping the dust off after each ride lets me go a long time between cleanings. My 19-year old saddle looks and feels great after being consistently conditioned with this stuff for the last ten years. I highly recommend it! Rated 5 out of 5 by Nichola from Best one I've used It brought life into a second hand bridle and now it looks brand new. I will never buy another brand. Rated 5 out of 5 by MelissaR from A great product I’ve been using this product for several years and it never fails to please. A great leather conditioner that also repels water, it’s my everyday go to for halters lead ropes etc. I also use on bridles girth’s and saddles. Never disappointed with this product! Rated 5 out of 5 by heidig from great product love this conditioner i have used it for years!!!! Rated 5 out of 5 by hertzk from Perfect Conditioner this has been perfect to condition my Passier bridle as well as my CWD saddle. It smells pretty good too. Rated 5 out of 5 by Eventer86 from Love it! My saddle looks great and is super supple. Great product! Rated 5 out of 5 by Mandy23 from Excellent stuff! I absolutely love this stuff. I was a little hesitant because I'd never tried it before, and old leather cleaning habits die hard, but it has far surpassed my expectations. I've since used it on my new calfskin saddle with wonderful results, it's made my stirrup leathers (calfskin lined, nylon core) extra soft and supple, and I used it on a smartpak bridle. It was shiny but a bit of a dull brown, and after the lederbalsam soaked in it was like a brand new bridle. It's now a rich brown with the same shine, and feels amazing. It also is working fantastic for arid climates such as Nevada. In more humid areas, I would only apply this perhaps once every 2 weeks - perhaps if you use the tack every day for multiple horses then perhaps once a week. So far, it also works beautifully on vegetable tanned leather! I am also going to put this on a new pair of tall boots when I get them. Why not, right? Definitely buying this stuff for the rest of my life.